One Question – Nancy will provide an answer for one question. Approximately takes 10 minutes. Extra time will be asssessed at $2.00 per minute. Full half hour reading – Nancy will lay out the cards and read them for you. Additionally, Nancy will answer specific questions you may choose to ask. 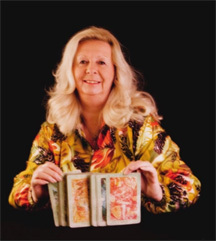 Nancy will do in person readings by appointment only. They will be taped. Full half hour reading by phone. Call in on 630-941-6816.